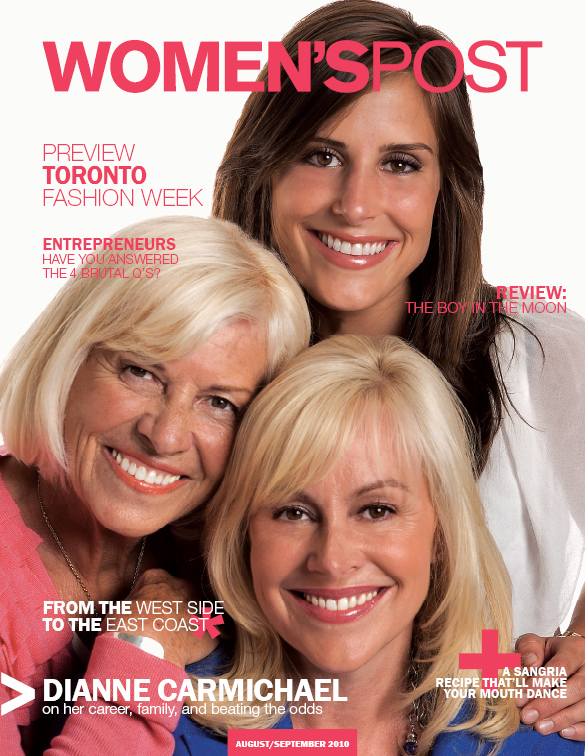 I was honoured to be profiled in the August/September 2010 issue of Women’s Post magazine. You can also download the the article here. Meet Dianne Carmichael, President of Best Doctors Canada, mother, daughter, Baby Boomer, and member of the Sandwich Generation. Dianne has had a high-profile career. She began her marketing and sales career with progressively more senior roles at Procter & Gamble (P&G), RJ Reynolds (Nabisco), and Gillette. She spent 15 years in the financial services sector, first building a top-tier private investment management practice, was then VP at TD Waterhouse, and finally was chairman and CEO of Worldsource Wealth Management. There she oversaw four national operations, three reporting presidents, 1500 investment advisors, and $5+ billion in assets. Then, a personal experience profoundly changed her career direction. Today she is president of Best Doctors Canada and head of Global Marketing, sits on the advisory boards of the Canadian Association of People Centred Health (CAPCH), the Academic Research Collaborative (ARC), and York University’s Department of Health. She is the expert health columnist at Women’s Post. However, Dianne will tell you that most important to her, she married her high school sweetheart Colin, is the proud mother of Jason and Amanda, and is Marion Leyland’s daughter. This also firmly wedges her in the middle of what demographers call the Sandwich Generation. In 2004 my dad was diagnosed with cancer. I’d had a successful career with lots of high-profile business contacts, yet I have never been so totally unprepared for anything in my life. The responsibility for making life-and -death health decisions was overwhelming. I vowed never to be unprepared again. During the last three days of Dad’s life, I disconnected from the world and sat by his side 24/7 in a small palliative room focusing on his every breath; on the meaning of life; on what’s truly important. That’s when the epiphany happened. I didn’t want others to feel alone, scared, and unsure the way my dad and I did, or to be tortured with doubts about their health care decisions. I wanted to make a difference in Canadian health care and to champion for patients. I am now president of an organization that empowers people with knowledge and certainty, and I fulfill my vow to make a difference every day. Best Doctors, a global organization founded by two professors of medicine at Harvard, is a medical consultancy and advocacy firm providing certainty to members facing profound medical crises. It links seriously ill members and their treating physicians with a community of 50,000 peer-nominated, world-renowned specialists in 450 specialty/subspecialties to confirm the right diagnoses and treatment options, and provides one-on-one personalized support; all without the member having to leave home, the treating physician, or support system. It’s available through employee benefits plans, attached to some insurance products, Visa cards, or directly online. I’m proud of our universal health care system, which provides equal access to every Canadian. But I know, with a growing and ageing population, that our system is overburdened. I worry about my children, my parents, and my husband. I worry about everyone faced with illness. Last summer we faced another health crisis, this time with my Mom. It reinforced my decision. My mother is an amazing role model. She truly pioneered the way for women in business – a model who rose to become president of Max Factor and later Revlon – all at a time when few women reached the top echelons of the corporate world. She has participated in international think-tanks, advising governments on issues like free trade. She won the cosmetic industry’s “Award of Merit” for exemplary contribution to industry and community. She is brilliant, beautiful, and successful. A mentor to my kids, she’s the coolest 75-year-old grandmother on the planet. She’s our hero. And last year we might have lost her. She’d been asked to decide between Door #1 and Door #2. How is a patient equipped to make a decision like that? Enter Best Doctors and Door #3. Mom was treated by one of the top gynecological surgeons in the world, right here in Toronto, with minimally invasive laparoscopic surgery, leaving her bowel intact. Incidentally, had she chosen Door #2 – going home – she might very well not be with us today; necrotizing tissue would rapidly have caused major infection. My daughter Amanda is a recent McGill graduate beginning her sales career at Xerox. She is focused, driven, and competitive – things honed playing university hockey, and perhaps a little to do with genetics. Coaching – about life and business – will be more important than ever for her future. Thankfully, her grandmother will continue to be a big part of that.